A young Peter Parker/Spider-Man (Tom Holland), who made his sensational debut in Captain America: Civil War, begins to navigate his newfound identity as the web-slinging superhero in Spider-Man: Homecoming. Thrilled by his experience with the Avengers, Peter returns home, where he lives with his Aunt May (Marisa Tomei), under the watchful eye of his new mentor Tony Stark (Robert Downey, Jr.). Peter tries to fall back into his normal daily routine—distracted by thoughts of proving himself to be more than just your friendly neighborhood Spider-Man—but when the Vulture (Michael Keaton) emerges as a new villain, everything that Peter holds most important will be threatened. Peps Goh: Before watching the movie, I was already super thrilled about our favorite web-slinger finally rejoining the MCU franchise. But being a second reboot, like many others, I was also wary about the quality of the film and didn’t dare to set too high of an expectation. (I, on the other hand, had an expectation for the film since Spidey’s appearance in Captain America: Civil War) My worry turned out to be for naught, as this collaboration between Disney-owned-Marvel and Sony came out great. Tiffany Yong: I’ve stood by firmly my preference for Tobey Maguire’s version of Spider Man when I reviewed The Amazing Spider-Man 2. It was an easy comparison, for the first two versions had similar villains and went through the same “I-got-bitten-and-Green-Goblin-tried-killing-me-and-Uncle-Ben-died-because-of-me” plot. So thank goodness, we don’t have to go through that again with the ever-getting-younger Peter Parker and his aunt May. My favourite moment came when Peter Parker surprised the audience with him putting on his costume and it had resizable visors which made it an instant skin-tight suit. Cool Max! Peps Goh: It’s hard not to make comparisons between Tom Holland’s version with the renditions that came before. But I’ll try to keep it to a minimal. The biggest that stood out to me, was the entire tone of the film, from the performance to the plot to the color treatment to the score. Homecoming held very pleasant vibes in contrast to the darker tones of it’s predecessors. Peps Goh: There is a natural inclination I think, to make superhero films a little darker in terms of plot, colors a little flat, and performance much too jaded in the attempt to make the fantastical feel more realistic and to be taken more seriously. Maybe it’s because the predecessors did not have a strong enough villain to get the audience captivated. Tiffany Yong: While we can argue that the villain Adrian Toomes and the villain in Spider-Man (2002) Norman Osborn had many similarities, Spider-Man: Homecoming gave me a way bigger shock when the plot was revealed. I was gasping out loud and exclaiming in surprise. It’s amazing how Michael Keaton’s Vulture/Adrain Toomes felt like a human who ain’t bad for the sake of being bad. His story has depth, and the audience could empathise with his plight. There was almost a Civil War moment where it was difficult not to feel for the antagonist when he was just doing exactly what Tony Stark did, in secret and ‘illegally’. Peps Goh: I think it is commendable that Marvel wasn’t afraid to let spiderman be a teenager, in a friendlier coming-of-age vibed picture. It was endearing to see Peter Parker as that under-appreciated socially awkward boy who tries to impress his idol (Iron-man) by attempting to balance his self-given ‘responsibilities’ that came with his great powers with his school commitments, something that the Amazing Spider-man failed terribly at. Peps Goh: Without spoiling much, there was however portions that lost momentum a little, that left me hoping for more of a spectacle. But the decisions made all remained believable and fateful to the character’s nature, hence I don’t have much to complain about it. 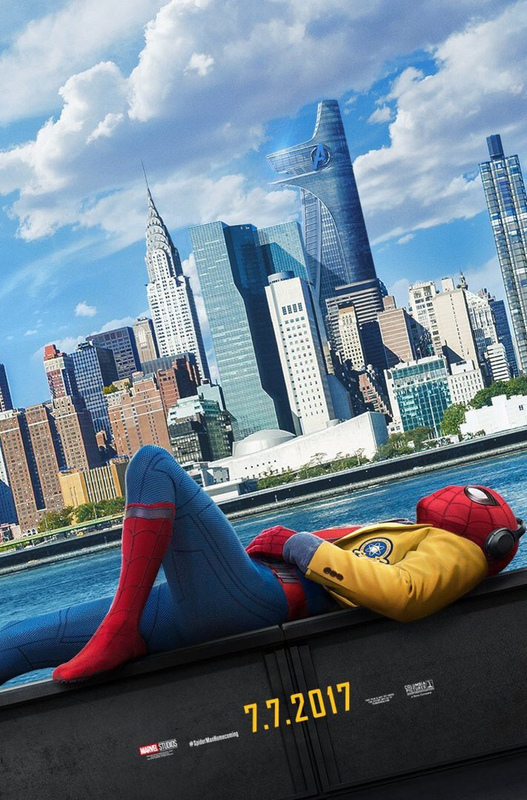 Peps Goh: Overall, Tom Holland’s Spiderman worked great even as a standalone piece, I think it would have been well-received by children and adult fans alike regardless of whether or not the predicating films were in regard. And the cameo of the endearing father-figure that is our charismatic iron-clad hero as a mentor only sweetened the deal that much more. Kudos to Marvel for the bold but successful attempt to merge the long time neighbourhood hero into the Marvel Cinematic Universe. Now, it’s just fingers-cross for me that Sony don’t attempt to reboot or try to take Spidey out anytime soon. Even before Disney and Marvel Studios had worked with Sony to bring Spider-Man into the MCU, a popular fan theory about Iron Man 2 (2010) was that Peter Parker was the little boy in an Iron Man mask who stands up to a killer robot and is saved by Tony Stark. Tom Holland loved this idea so much that he asked Kevin Feige for permission to confirm this idea as official and Fiege agreed. In the classic Marvel comics Ned Leeds (Jacob Batalon) is a reporter at the Daily Bugle, not a friend or classmate of Peter Parker. He is also based on Ganke Lee (a chubby Chinese schoolboy from the Miles Morales Spider-Man comics who knows his friend’s secret identity). The scene in which Peter, through sheer force of will, lifts the machinery pinning him down after the Vulture forces the structure to collapse on him, is a nod to a scene in The Amazing Spider-Man #31-#33 in which he does the very same thing. The panels in the comic are considered by many to be some of the most iconic in Spider-Man’s history. The concept of Spider-Man’s ability to change his web-shooter’s settings through voice commands in the film was adapted from the comics which was first seen in the first issue of the fourth volume of the “Amazing Spider-Man” series which was released at the end of 2015. When Liz and the other girls are talking in the gym, and the subject of Spider-Man comes up, Betty mentions that he ‘could be almost 30 under that mask’. This could be a nod to the two previous Spider-Man film actors, Tobey Maguire and Andrew Garfield, who were in their mid to late 20s when filming their respective Spider-Man films. Asa Butterfield was originally the main choice to play Peter Parker/Spider-Man because Marvel had liked him since Day 1 when they announced the top 5 actor shortlist to play Spider-Man, which were Asa Butterfield, Nat Wolff, Timothée Chalamet, Tom Holland, and Liam James. Chandler Riggs auditioned for Spider-Man. Michael Keaton is the third actor from the Batman series to cross over and appear in Spider-Man or vice versa. He plays the Vulture which is a man in a bird costume. Coincidentally, Michael Keaton starred in the Best Picture winning film Birdman in 2014 and that character is based off of Batman, which Michael Keaton played in 1989 and 1992. Cliff Robertson appeared on the 1960s Batman television series, and also played Uncle Ben. J.K. Simmons played J. Jonah Jameson, and now plays Commissioner Gordon. The Vulture in this film salvages alien tech and reworks it for his own use. This scavenger nature is similar to how vultures actually live. This is Robert Downey Jr.’s 8th time playing Tony Stark (after the three “Iron Man” films, cameo in “The Incredible Hulk”, “The Avengers”, “Avengers: Age of Ultron”, and “Captain America: Civil War”). It also marks the first time that a Spider-Man film include another superhero character from the Marvel Cinematic Universe. Nick Fury was originally going to be Peter’s mentor in the film with Samuel L. Jackson reprising his role but they went with Tony Stark instead. Kenneth Choi who plays Principal Morita also played the Howling Commando Jim Morita in Captain America: The First Avenger. In the Principal’s office you can see photos of the Howling Commando which hints that they are related and he is possibly his grandson. Check out Spider-Man: Homecoming (2017) Official Website and Facebook Page! Spider-Man: Homecoming (2017) is out in cinemas on 6 July 2017. My fiancé and I love superhero movies but we haven’t managed to see this yet. It looks like a good, fresh take on Spiderman. Thanks for sharing. love all the pictures you included. some have liked this movie, it was hit or miss others said. I haven’t seen the movie yet and I liked how you didn’t give away any of the details. I also liked the way you compared the other movies and actors to this one. Great review! Looking forward to seeing the movie. I can’t miss this! I am so going to watch it soon! Gotta take my little mentee to see this. I’m not usually a SpiderMan fan but you make this movie so appealing! I’m going to have to check it out!! I have liked all the spidey movies prior and can’t wait to keep up with new ones! My sister is thrilled about this movie. I, however, am feeling it is geared for the younger generation and causes disruptions to all we have seen thus far.